The item Greg & I purchased with our Christmas money finally arrived yesterday. It’s a linen cupboard I ordered from Plow & Hearth. 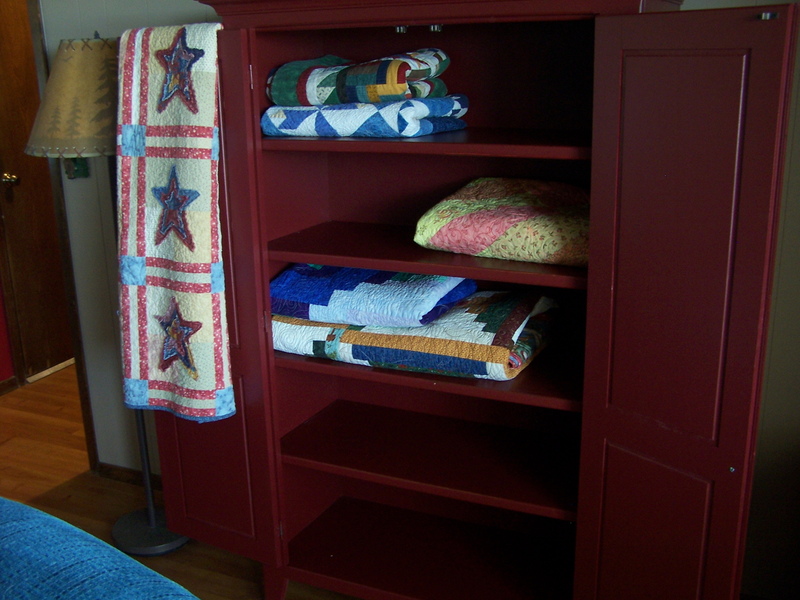 Finally, someplace to display and store our quilts. It came in several different colors, and I was really torn between the red & the black options. 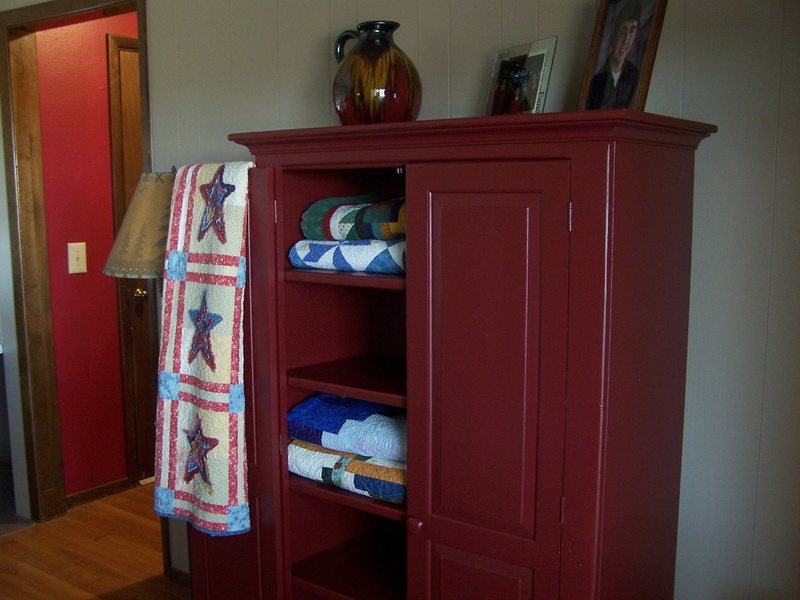 We ended up going with the red, as both hallways off of the living room are red. Looks great Randi. I can’t wait to see you fill it up. Don’t let the stash take it over! Looks great, and I love the red color. Your quilts sure look good in it! Oh, I love it! The way you’re stashbusting, you’ll have it filled in no time. Looks Great, Randi. I love your raggy star quilt. Go Mom and Dad! New to your blog and can’t wait to visit often. This cupboard is fabulous and perfect! Me likey, Randi! I wonder if I could find a place for one? Lovely piece of furniture. I found a cane hutch that I had and brought it out and used that…will do me for the rest of my life. 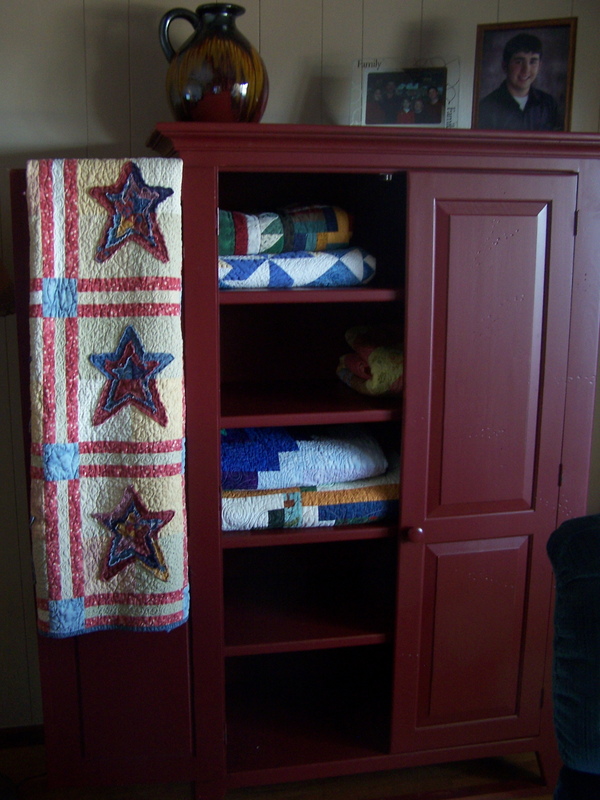 It is so nice to have your quilts out somewhere like that. Nice cabinet! I looks even lovelier with your quilts in it. Randi, I am so jealous (no, envious) of you!!! That’s a pretty cupboard!!!! I would love to have one just like that.